Our annual meeting in Sonoma County was well attended with 290 attendees. We hosted 35 exhibitors with 66 representatives. 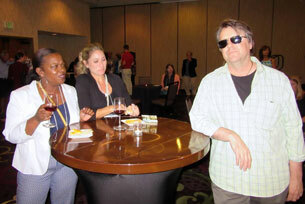 It wasn't just CACEO members - we had 57 non-members in attendance at the conference. It's a scary proposition when official paper is running low to print vital records. This paper is used to print all vital records, including Confidential Marriage Licenses - California Recorders and Clerks are actively seeking a solution. Orange County will be hosting a special peer-to-peer review of their experience with the launch of VoteCal. The meeting (August 11th) will be webcast statewide for those unable to attend in-person. More details to come soon. Secretary Padilla was in Orange County (above) for the launch of VoteCal on July 20th. Three additional pilot counties will be launching soon pending the outcome of testing. The remaining counties will be deployed in waves running from October through March 2016. Inyo County is part of a winning team of the Knight News Challenge. Their project seeks to develop a Civic Engagement Toolkit for Local Election Officials. The kit will include a set of tools for election offices such as an election website template, visual icons and illustrations, resource allocation calculators, and other tools. You can be a part of this exciting opportunity - click here to read more.